Hey friends! I don’t know about you, but traveling is one of my favorite things to do, and when I do travel, I want to look my best, but at the same time I want to keep things as simple as possible so that I can be more focused on the experiences I am having than how I look. I want to look put together and stylish, but I don’t want to spend a lot of my time getting ready. You want to look stylish when you travel, but you don’t want the hassle of extra baggage. So, how do you balance fashion and function? There are simple ways to make the most of what you already have without compromising your personal style. It just takes a little practice and strategic thinking ahead of time. The best thing to do is try out the looks you want to take with you. Lay out simple, versatile items, and create 10 to 15 outfits. In the picture above, you can see how I laid out these black and white shorts, and then added three tops that I could mix and match with them. This is what I do when planning outfits for travel. After I have them laid out, I start cutting out certain items. In the weeks before your departure, you may want to wear each outfit so that you know how it feels and what kind of hair, makeup, and accessories you can match with it. Streamline your essentials and try to cut out stuff you don’t need. If you have no idea where to start, here are some ideas to get you going. Makeup is fun and trendy, but it’s time-consuming and requires carting around a bunch of bulky products. Women around the world are opting for a more natural look and using makeup to fill in the gaps, add hints of color, accentuate features, and reduce redness and blemishes. Learn to let your true self shine through as the French women do. You can read a french girls essential secrets here. Less makeup means less time fussing in the bathroom and more time exploring. It also means less baggage and a lighter load on the road. I love makeup, this is no secret. I wear makeup to work every day. And I do want to look my best while traveling. But I also try to minimize the makeup I take with me. I choose one neutral pallete to travel with, and maybe a few different lip colors. I love this Naked 2 Pallete every day, and especially when I travel because you can do various looks with it. Stick to essentials such as a light foundation, concealer, thickening mascara, and neutral pink lipstick. If you like to wear eye color, choose a shadow pencil or a pallete with neutral colors. Feel free to add a bright red, glossy lipstick for special occasions or to make your pout stand out. If you’re camping or spending a lot of time outdoors, you probably don’t need to bring your turbo hair dryer and state-of-the-art curling iron. A few elastic bands and some hair pins should do the trick. However, if you plan on indulging in the nightlife, you might need a few tools. Check with your hotel or place of lodging to see if they provide a hair dryer. Consider purchasing smaller, travel-sized hair tools so that you don’t have to pack bulky items in your suitcase.I usually don’t bring a hairdryer, because most places have one nowadays. and I stick to one straightener to travel with. I can style my hair both curly and straight with the one I use, so it works for most ways I want to wear my hair. 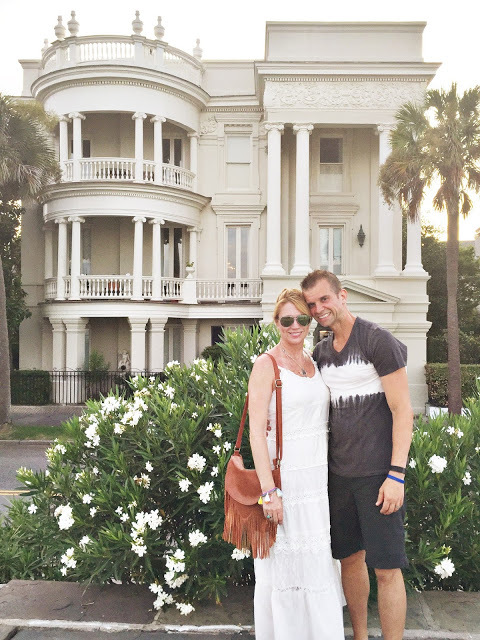 Below is a picture of my husband and I in Charleston, South Carolina. It was one of my favorite locations, and as you can see I was wearing my hair up, which I do very often when traveling. This is also one of my favorite travel dresses, and it has been with me in LA last summer, and it was also with me in Charleston, SC. The bag is also one that I love to travel with because you can also wear it as a cross body bag. Better yet, consider going au naturel and letting your tresses hang loose. You can always use simple products such as curling lotion or finishing oil to tame frizz and keep your locks from going too crazy. For long hair, a simple braid pulled to the side can be quite flattering, and short hair looks cared for when pinned back near the ears. Layering allows for versatility and endless mix-and-match outfits, which saves you time, suitcase space, and money both at home and on the road. Layering doesn’t have to be boring, however. There are ways to create a sharp layered look when you have the right pieces. When building a collection, start with basic pieces and neutral colors. For example, choose black, white, and gray tank tops, t-shirts, and thin, long-sleeved sweaters. From there, you can add different colors, patterns, and cuts to express your personal style. Just make sure the colors and looks coordinate so that you don’t limit yourself to single outfits. Here is an example of a layered look I wore not long ago. I could have easily thrown on a jacket or coat over this for one more layer as well. You can also add collared shirts, blazers, and bulkier sweaters once you have the basics in stock. The idea is to start with a tank top, then add a shirt and a sweater or jacket on top. Depending on the weather, shoot for three or four layers at most. If you need more than four layers, you’re better off grabbing a heavy coat. Proper footwear is important while traveling. The last thing you want is sore feet while you’re trudging around. Assess the climate of your destination and choose three pairs of shoes, max. For example, you might choose a pair of stylish sandals, peep toe heels, and mesh flats for warmer climates. However, for cooler weather, you want to go for ankle boots, closed-toe pumps, and insulating sneakers. Resist the urge to clutter your suitcase with bulky shoes and opt to bring only the essentials. Now, I am giving you some good advice here, but I can’t swear that I always follow it myself! It is hard to choose only a few pairs, but I do my best to minimize and choose shoes that will go with everything. 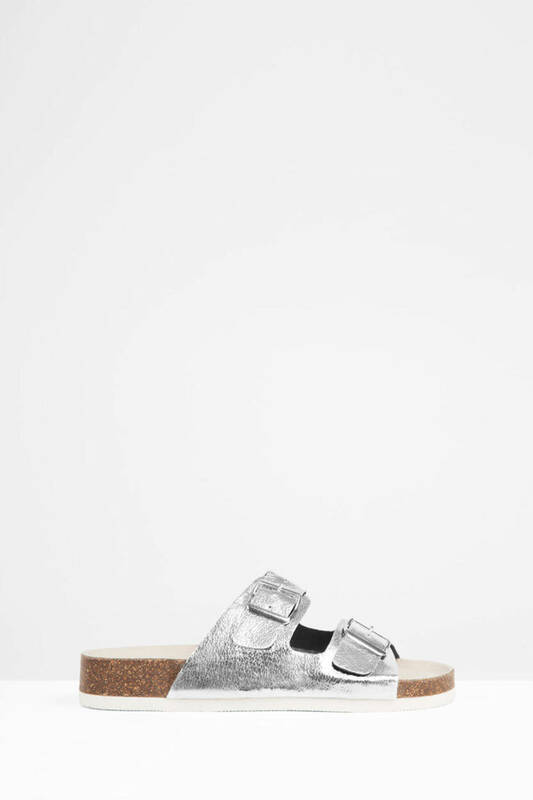 I absolutely love these sandals for travel. I have taken these type of sandals on my past three vacations. I think they are on trend right now and they are comfortable to walk in. Of course these are casual, so I always take another pair that I can slip on for dressier occasions too. When you focus on simplicity, you’re able to relax more and deeply enjoy your travels. 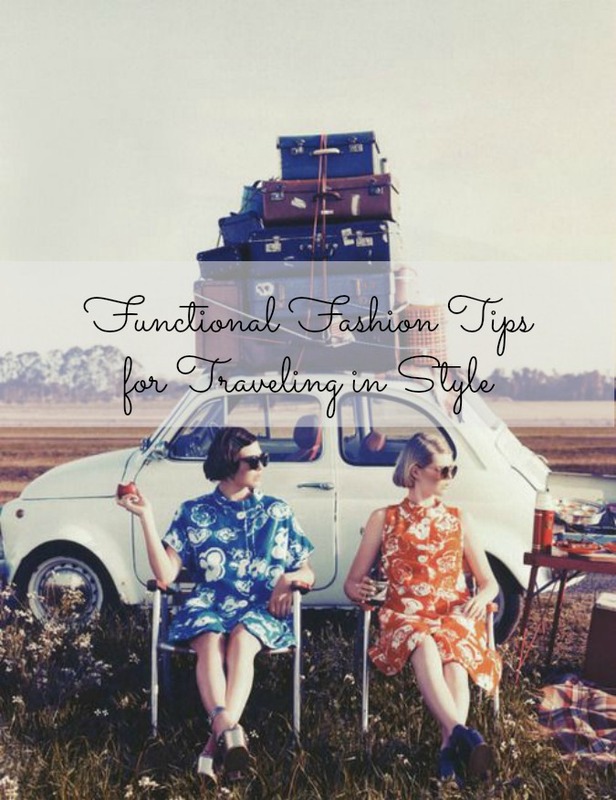 Pack light but strategically so that you look and feel your best during your trip. Always leave a little room in your bag to pick up a few unique items as fashion souvenirs. I have to admit I am not great at packing lightly, but I am working on it! 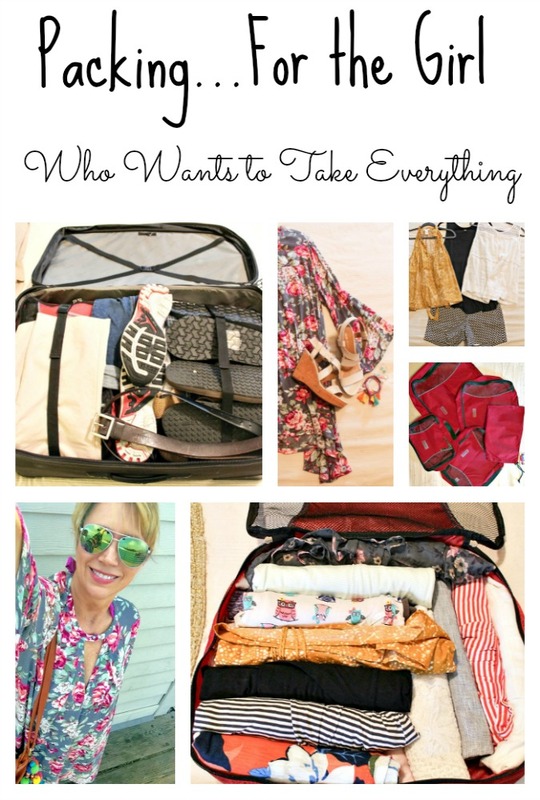 I wrote a post last summer called Packing Tips for the Girl Who Wants to Take Everything, and you might find some helpful tips. Having a good plan is key for me. For your convenience, this post contains affiliate links. If you click on them and purchase an item, I will receive a small percentage of commission. 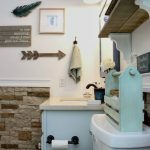 By clicking the link, you are NOT paying any more than you ordinarily would, and you are helping support me in keeping this blog up and running. This post was a collaboration, and I may have received compensation. However, all of the thoughts and opinions expressed, are my own. Hope you found some of these tips helpful today! I already have our next vacation on my mind. I don’t want to mention it yet for fear that it won’t come to fruition, but hopefully in a month or two we will have some final plans about where our next adventure will be and I can’t wait to share it with you! Thanks for sharing these great fashion packing tips with us at Funtastic Friday. Thanks for hosting Sherry, it’s a great party! Traveling always requires a bit of downsizing, but it doesn’t mean your wardrobe has to suffer for it. Great tips! I totally agree Heather, thanks so much! That’s an awesome article to read and to implement too. You said it perfectly, “Consider purchasing smaller, travel-sized hair tools so that you don’t have to pack bulky items in your suitcase.I usually don’t bring a hairdryer, because most places have one nowadays. and I stick to one straightener to travel with”.. i knew some tips like Simplify Hairstyles and minimal your make up but the Leave Room in Your Suitcase is totally new to me . Thanks for sharing such valuable info with us. Hope it will continue.